These are natural, clear quartz crystal formations from Hot Springs, Arkansas that have been bombarded with titanium in a lab in Rochester, Minnesota to permanently coat them with this beautiful iridized color. 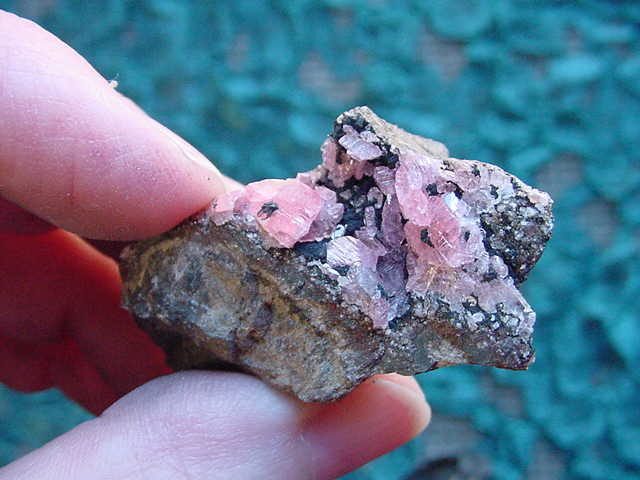 This is by far the most interesting and popular mineral we have in the shop! 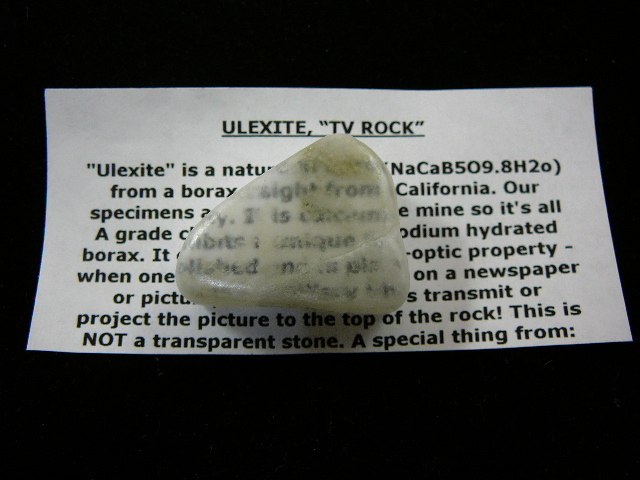 "Ulexite" is a natural mineral (NaCaB5O9.8H2o) from a borax mine in Boron, California. Our specimens are straight from the mine so it's all A grade clarity. It is calcium-sodium hydrated borax. It exhibits a unique fiber-optic property - when one polished end is placed on a newspaper or picture, the capillary fibers transmit or project the picture to the top of the rock! This is NOT a transparent stone. Kids just know it's weird and wonderful! 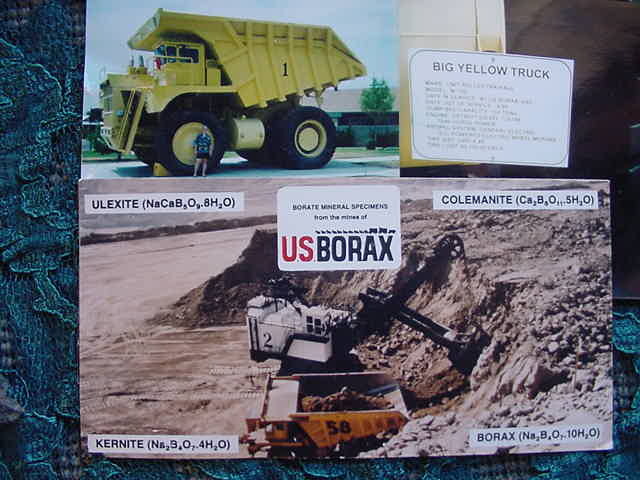 Above is a photo of the borax mine in Boron, CA where we obtained the Ulexite. 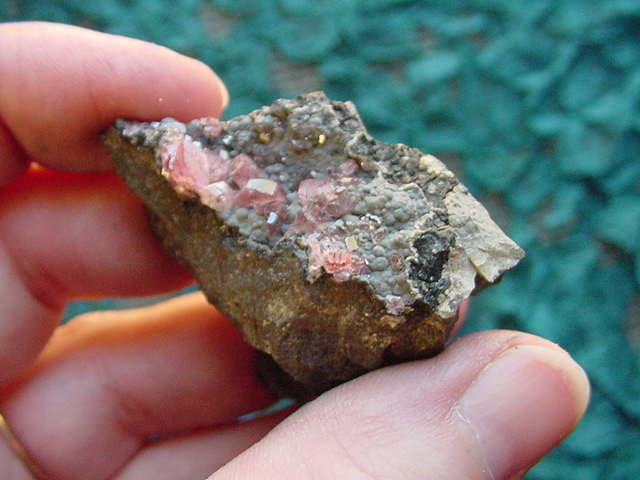 Colemanite and Kernite are also mined here. Lest you think this truck is not very big, see Heidi standing in front of the tire on the top picture. 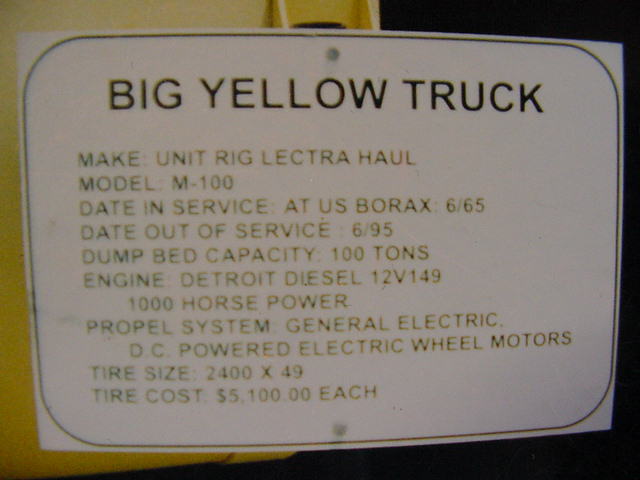 The specs of the monster truck are in the right-hand picture. Photos below are on a standard business card. 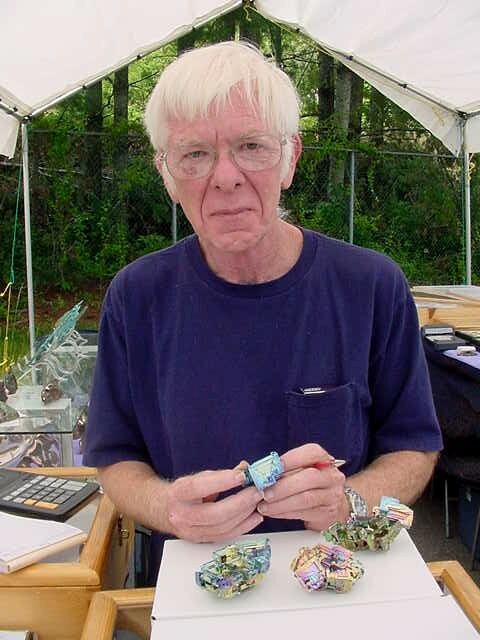 Our specimens are from North Carolina where we found "Mad Scientist Bill" who's been growing them for 12 years. Bill recently passed away (8/16/04), he will be sorely missed as a gentle and kind friend. 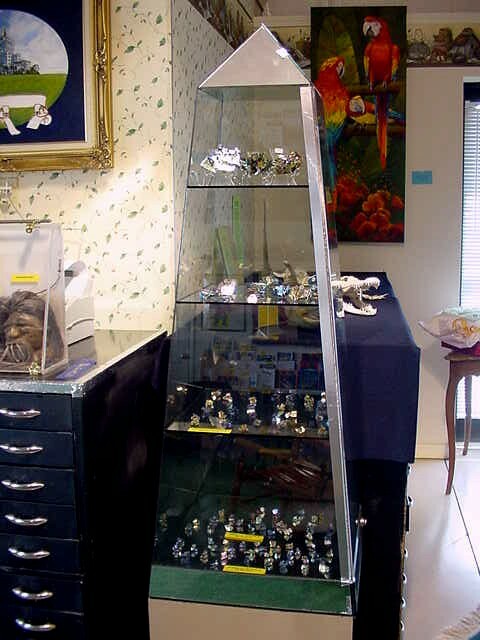 The second picture is the lovely display we made of the specimens we purchased. Native element (Bi) originally found in Peru, perfect crystals are grown from pure bismuth in lab conditions. Blue and rainbow colors are natural. Amazing patterns of stair steps! 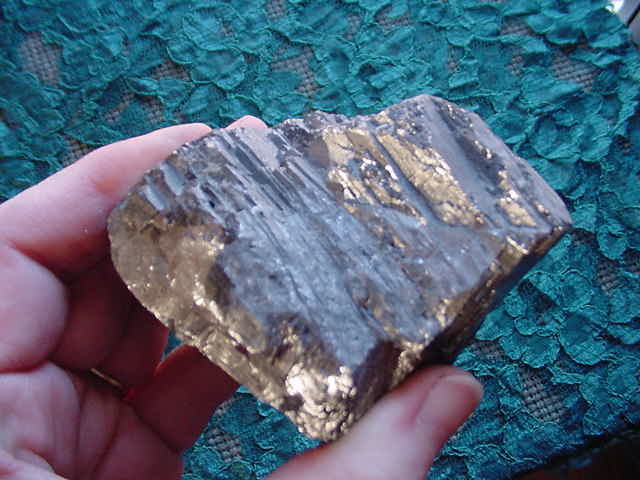 Scarce as silver, heavier than lead (1 cubic foot of bismuth weighs 600 pounds), semi-metal. Non-toxic, used in medicines and cosmetics (the BIS in Pepto Bismol, for instance) it makes a superb display specimen and gift. 30 to 51 grams; 1-3/8" to 2-1/4"
1-5/8 x 1-1/4 x 1-1/2"
2 x 1-5/8 x 2-3/8"
Used to make shortwave radio sets, extremely heavy, bright gunmetal luster. 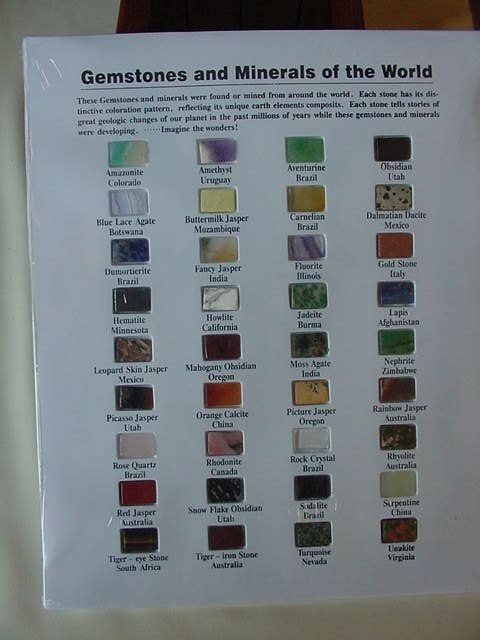 This is not only a rock & gem identification display, we've included some more unusual specimens for people to enjoy. Photo 2 - Rainbow hematite, red coral as used in Indian jewelry, several great turquoise specimens from Arizona, a calcite & mud concretion material that formed fantastic blue layers, selenite from Nevada, a huge specimen of Colombian amber loaded with winged ants and many other creatures that fossilized into it for 5 million years, and the beginning of our meteorite display. 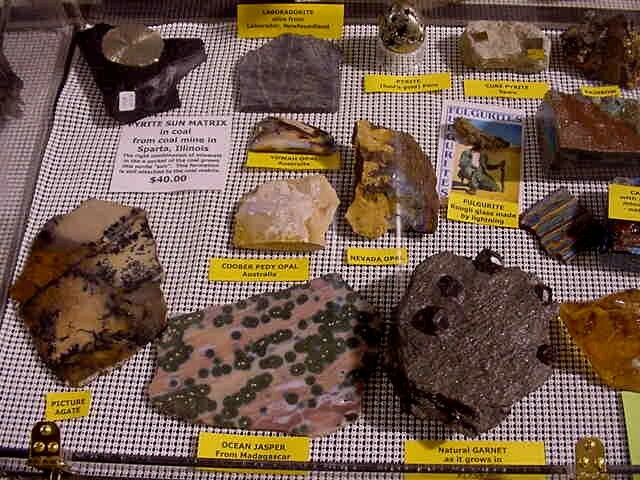 Photo 4 - More meteorites. 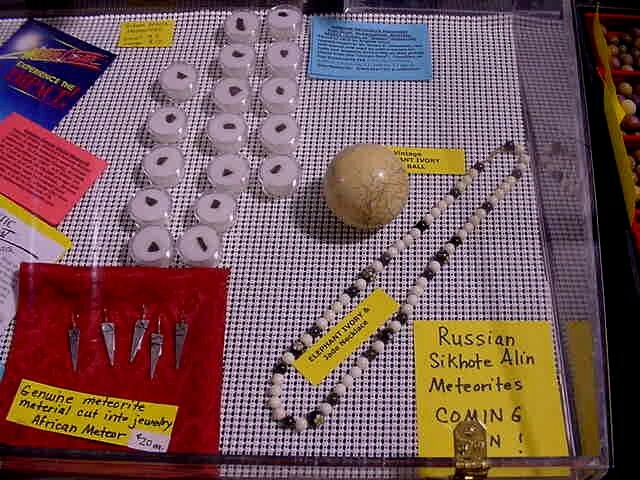 Plus an elephant ivory cue ball, and a lovely elephant ivory and Canadian jade beaded necklace. Meteorites are all for sale, the ivory is not. 1. The sign on the side of the road says "Falling Rocks" and you pull over. 2. 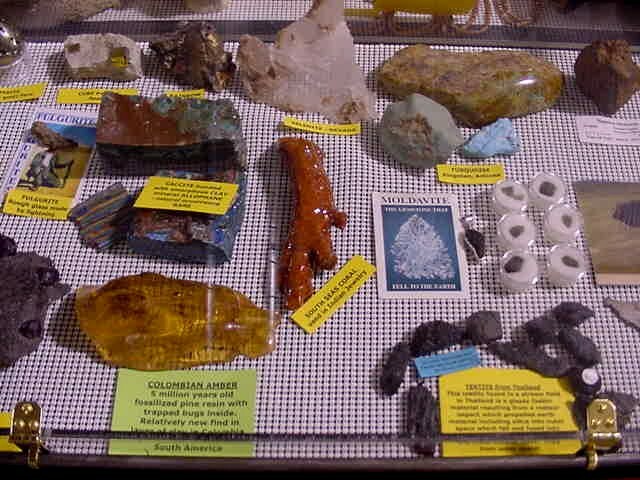 First thing on your Christmas list is to go to the Tucson Gem and Mineral Show or at LEAST Quartzite. 3. Your pet's names are Rocky, Opal,and Beryl. 4. You care more about the diamonds in the Titanic than the people. 5. You hit your hand with a hammer and your mom asks if you're okay, and you say it's a fracture, good cleavage, and has produced some interesting streaks in your underwear. 6. Your family puts birthday candles in a slab of amethyst instead of cake. 7. The rock pile in your garage is taller than Shaq. 8. The people at the airport know you by name and refuse to carry your luggage. 9. You know every rock shop within a 100 mile radius. 10. You associate the word "saw" with diamonds instead of wood. 11. You know where Tsumeb is. 12. You buy buckets of drywall just to use the buckets for storage of more rocks. 13. You have a two car garage and your car is outside. 14. You give rock tumblers, tools, and rock specimens as Christmas gifts. 15. You make a backpack for your dog named Crystal. We had a very successful event with almost 700 participants and LOVELY weather. We rocked the day away with lots of fun and smiles at every turn. My stone animal collection will stay up throughout the summer so I can share it with our day campers. I hope it will inspire others to start their own collections. I’ve attached some photos highlighting the event activities – enjoy! 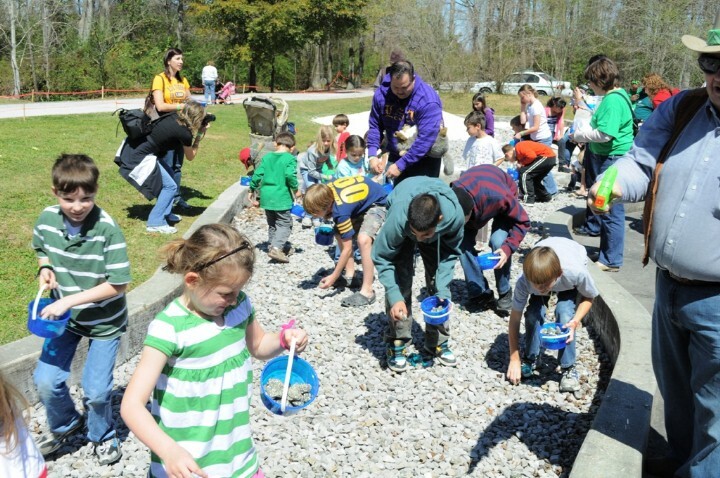 Rock painting - paint a rock python! These young people are creating gemstone cards. Fulfilling? Just look at those smiling faces! FAIRY STONES, natural crosses called "Staurolite" crystals found in Virginia that are chiseled from the rock and made into jewelry. Visit the Pendants page 5 to purchase rough, finished or jewelry forms of this religiously significant rock. Link to Fairy Stone Crosses Page for a great selection we have available!